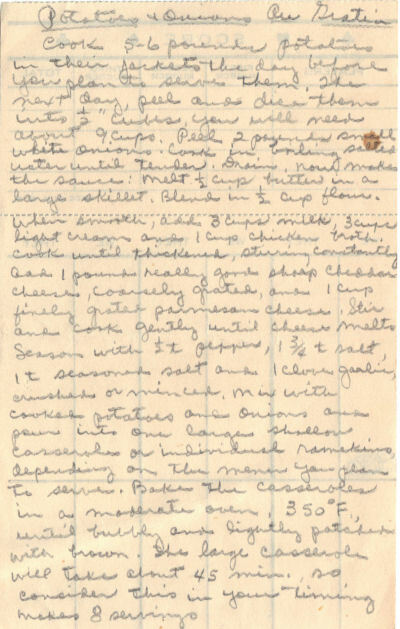 This recipe was written on a scrap of paper and found in a large collection, date unknown. I’ve typed it below along with a scanned copy. Cook 5-6 pounds potatoes in their jackets the day before you plan to serve them. The next day, peel and dice them into 1/2″ cubes. You will need about 9 cups. Peel 2 pounds small white onions. Cook in boiling salted water until tender. Drain. Melt 1/2 cup butter in a large skillet. Blend in 1/2 cup flour. When smooth, add 3 cups milk, 3 cups light cream and 1 cup chicken broth. Cook until thickened, stirring constantly. Add 1 pound really good sharp cheddar cheese, coarsely grated, and 1 cup finely grated parmesan cheese. Stir and cook gently until cheese melts. Season with 1/2 t pepper, 1 3/4 t salt, 1 t seasoned salt and 1 clove garlic, crushed or minced. Mix with cooked potatoes and onions and pour into one large shallow casserole or individual ramekins, depending on the menu you plan to serve. Bake the casserole in a moderate oven, 350°F., until bubbly and lightly patched with brown. The large casserole will take about 45 min. so consider this in your timing.